Oak Marr is a 50-meter pool with 21 short course lanes. 15 lanes will be used for competition. 11 and over preliminaries sessions and the 10 and under sessions will be swum in two courses. Finals sessions will be swum in one course. Continuous warm-up/and warm down lanes will be available throughout the meet. "Special Note: Fairfax County Park Authority limits the number of swimmers and overall number of persons in their aquatic facilities for safety reasons. The Meet Manager reserves the right to limit entries to enforce this policy. Spectators are not allowed on the pool deck and seating is limited." NO SNACK BAR WILL BE AVAILABLE AT THIS MEET. 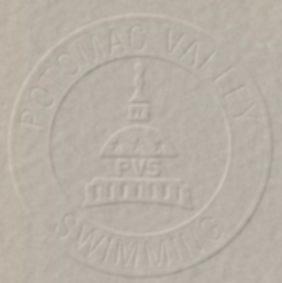 The prescribed Potomac Valley Swimming warm-up procedures and safety policies will be followed. Teams will be assigned lanes for warm-ups. Coaches are responsible for monitoring their swimmers during warm-ups and the meet. Note: The Meet Manager reserves the right to modify the warm-ups based on the number of entries. Coaches will be notified by email in such an occurrence. PVS Teams – AAC, ASA, FBST, HACC, HOYA, MACH, OCCS, PM. RIPS, SDS, YORK Athletes shall compete at the age attained on the first day of the meet. Contestant may enter a maximum of seven (7) individual events and may not participate in more than three (3) individual events per day. Top sixteen (16) 11-12’s, 13-14’s & Senior qualifiers from prelims on Friday and Saturday swim in finals. Order of Finals is B, A.
Sunday is times finals only. All Relays are timed finals, swum in the prelims. 11 & Older Boys and all 8 & U's will swim in the seven (7) lane pool. 11 & Older girls and all 9-10's will swim in the eight (8) lane pool. Everyone will swim in the eight-lane pool closest to the diving boards for finals. Teams may enter ONLY two (2) relays per event. Medals 1st through 8th place Ribbons for 9th through16th for individual events and 1st through 3rd place for relays. Officials assigned to this meet should sign in at the recording table 10 minutes before the start of the warm-ups. Certified officials who have not been contacted and would like to volunteer should contact Jim Thompson at 703-435-3124 or jimthompson5802@aol.com, or speak with the deck referee at the meet. · Teams must enter on computer disk (Hy-Tek). Please send two disks. Include one meet entry report by swimmer and one report by event. · Submit entries to the Meet Manager, Nancy Monaghan at monaghans@gmail.com . In the subject heading please indicate "2008 Cherry Blossom Meet - ####" with the club's initials substituted in place of the number symbols. If the club is submitting entires from more than one location, please add the location to the heading with the club initials. Check payments must be received at the address listed prior to the start of the meet. Before preparing your entries, events for this meet can be downloaded and then imported into team manager (go to team manager/file/import/meet events). Fees for individual events are $5.00; relay events are $12.00. Each club is requested to remit one check to cover the entry fees for the entire team. Late (deck) entries are $10.00 per individual event and must be submitted no later than 30 minutes prior to the first event of each session. Evidence of current USA-S registration will be required for deck entries. This can be done by presenting a copy of the athlete's USA-S athlete registration card. MAKE CHECKS PAYABLE TO: "YORK SWIM CLUB". Positive Check-in Required for all 200 yard events. POSITIVE CHECK IN TIME 7:30 A.M.
@ All Relays will swim in the prelims session. POSITIVE CHECK IN TIME 7:45A.M.